Have you fallen for Swoon? 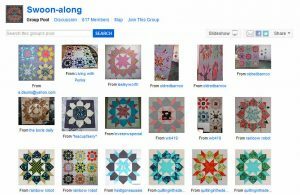 If you haven’t yet seen Camille Roskelly’s newest quilt design Swoon, check out some of the Swoon inspiration we’ve found! Read on to find links to other quilter’s versions of Swoon and find out where to get the Swoon pattern. Here is Camille’s version of Swoon from the Thimble Blossoms website – isn’t it pretty? We’ve also found some beautiful Swoon quilt blocks popping up all over the web. Camille has shared a whole bushel of Swoon blocks at her blog, Simplify. This beautiful example of Swoon was made by Amanda from hey porkchop! (click on the photo to see more of Amanda’s awesome Swoon quilt). To get your own downloadable Swoon quilt pattern for only $8, visit Camille Roskelly’s online store, Thimble Blossoms. Happy Swooning!